That the music was totally new to the audience made no difference - by the end of the show they were left mesmerised. The Premier Hall in Thurles has hosted many memorable events down through the years, but few captured the emotion and mood of the audience as much as Michael Collins - A Musical Drama did on the last week of March. 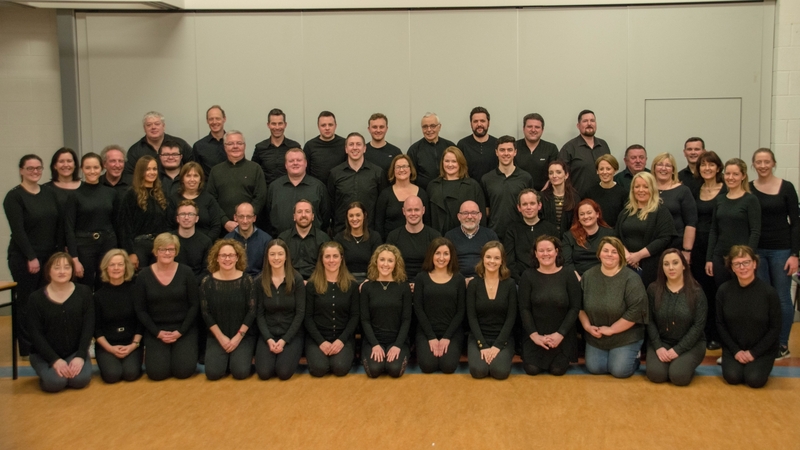 Played to packed attendances by Thurles Musical Society, the five night run saw an incredible reaction from those who came from far and near to witness a blockbusting show which told the Michael Collins story until his demise at Béal na Bláth, Cork. The show, written by the late Bryan Flynn, has received rave reviews, and the presence of Bryan's father and mother John and Teresa, his brother and sister, made the production even more special - they were overcome with emotion having witnessed the work of their son and brother undertaken in so spectacular a manner. Indeed, when they came to meet the cast afterwards, the poignancy of the moment was lost on nobody - the Flynn's were speechless, choked up with emotion but anxious to meet, greet and shake hands with those who had carried the story so well on stage. There was a special word for Marie Therese Kirby who played the part of Kitty Kiernan - the best Kitty Kiernan they have seen in any production, they said. Director Oliver Hurley, Musical Director Mary Rose McNally and Dance Captain Michelle O'Connell, as well as the stage crew, back stage crew, lights, sound, costumes, front of house and and many other elements which go towards making a show, have been lauded for their great efforts in bringing a script to stage - AIMS President Seamus Power, from Carrick-on-Suir, was lavish in his praise for the work, time and commitment given to the show. However, it was those on stage who brought the show to life, gave it the energy, the passion and the finesse. They had toiled since January and their efforts were appreciated with standing ovations greeting the company at the end of each performance. The sustained applause was more than justified as the memorable music score pulsated through the veins and raised many a hair on the back on the neck - in truth it was a stirring, thought-provoking show which seemed to pull at a heart strings in all of those who came to see it. Described as being “the Irish Les Mis,” it was certainly hard to argue with the statement and the performances of Keith Dwyer-Green as Collins, Marie Therese Kirby as Kitty Kiernan, Cathal O'Donoghue as de Valera, John Hayes as Harry Boland, Peter Donnelly as Joe Emmet were simply outstanding. What a magnificent front line and when you add in Deirdre Hayes as the haunting Mother Ireland, John Butler as Arthur Griffith, Jonathan Gleeson as Cathal Brugha, Gavin Murphy as the young volunteer, and the many other parts which made up this brilliant show, it is clear that Thurles Musical Society was spoiled for choice when it came to choosing parts. A scene from Dail Eireann at the Treaty vote, during Michael Collins - A Musical Drama with JOhn Butler playing the part of Arthur Griffith. For many though, the extraordinary power and emotion of the chorus sold this show. With almost sixty on stage, the chorus raised the roof and when the uileann pipes joined with the fantastic orchestra, the sound was out of this world. Power, precision and perfect harmonies were the order of an evening with acting talent and supreme movement and dancing being very plentiful throughout. That the music was totally new to the audience made no difference - by the end of the show they were left mesmerised by the score, and departed The Premier Hall humming the air to the likes of Fly the Flag of Freedom, Every Heart Awaken, and A Toast to the Host to mention but a few. The story of Michael Collins has been written in chapter and verse on many occasions, by many different scribes. But, Michael Collins - A Musical Drama is different. Though accurate to the story, including quoting many of the speeches directly, the show brings the tale to life and gives a real interpretation on the characters of Collins, de Valera, Boland and Kiernan, with the main focus being on Collins. “Revolution devours here own children” - so goes one of the lines in the show after Collins' friend Harry Boland has been killed. How appropriate a summation of his life and the times of our great country. For achieving theatrical excellence once more, take another bow TMS.